The recent approval by Health Canada of the TECNIS® Symfony Intraocular Lens (IOL) is good news for people with cataracts and those who may have trouble reading or focusing on close objects (presbyopia). The Symfony lens is the first and only extended range of vision IOL to correct presbyopia and improve vision in people with cataracts, as well as correcting far, intermediate, and near vision, with the decreased need for glasses. Dr. Herzig has been a pioneer in the use of the Symfony lens that is now approved throughout Canada. A cataract means that the natural lens in the eye is cloudy. The clouding can be mild or very dense. The common signs associated with advanced cataracts include blurred or hazy vision that can’t be improved by changing glasses prescriptions; a feeling of a film over the eyes that doesn’t go away with blinking; a change in distance and/or near vision; and an increased sensitivity to glare, especially at night. The condition is very common due to the fact that most cataracts are related to the aging process. It can occur in one eye only, or both eyes. Cataracts can be detected by performing an eye exam with dilating drops. The Refractive Lens Exchange procedure, using the new Symfony lens, has become so safe, and such an easy experience, that many patients opt for this procedure rather than Laser Vision Correction in order to restore both distance and reading vision. When a patient comes in, it’s important to assess them for the right procedure, depending on their occupation, their hobbies, and the nature of their eyes. There are different procedures that work better in different situations. Cataracts are a vision problem that nearly all of us will face as we age. If you are concerned that you or someone important to you may have cataracts, call the Herzig Eye Institute. If you’re not a resident of Canada, no problem. Herzig Eye Institute is still happy to help you with your vision. Simply contact us for a consultation. 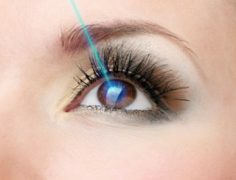 We’ll examine your eyes and make a recommendation for the procedure for you.